Hotel Villa Sonia, Taormina. Villa Sonia Hotel Taormina. For those who want to spend a unique and relaxing stay in Sicily, the Hotel Villa Sonia is the perfect destination for you. This splendid structure is housed inside an ancient rural house and lies in Castelmola, a lovely and calm district of Taormina. The hotel is characterised by welcoming and agreeable ambiences, in order to make your stay as pleasant and relaxing as possible. The Hotel Villa Sonia is immersed in a luxuriant green area, which makes it the perfect place for family holiday, but especially for romantic escapes. Our guests have the possibility of enjoying this charming ambiences and living again the ancient times. Moreover, the courteous and qualified staff of our structure is at your disposal for every need or request. The structure offers comfortable rooms. 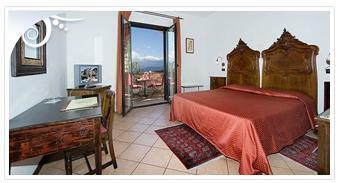 The main part of the rooms is provided with a balcony, which overlooks the Etna. Our guests can enjoy unique awaking, as well as the unmistakeable fragrances of this marvellous region. As concerns the appointment with the gastronomy, the hotel boasts an excellent cuisine that proposes delicious dishes of the typical Sicilian cuisine. Come to spend an unforgettable and relaxing stay at the Hotel Villa Sonia.